Flick Tips! * As seen on Dragons Den (I love that show!) There are a wonderful creation and idea for those who just can't ever get the perfect winged liner look. I'm not bad, but there are some unusual flicky patterns in here that I would never create by hand. I'll post a look with these soon. Available here! 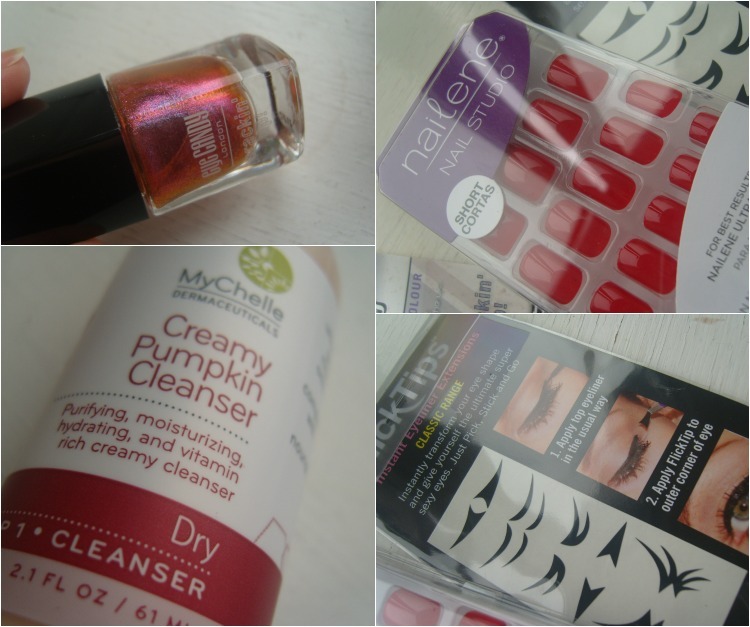 MyChelle Creamy Pumpkin Cleanser. * This is a hydrating cleanser, which is great for dry skin. It is cruelty and gluten free and it smells amazing! This just smells warm and inviting and festive. It leaves my skin feeling really polished and smooth to touch. It is rich in antioxidants and minerals, so it is packed with goodness for the skin. Nailene Nails - Red. * Love these! They are perfect for the glossiest, most red, glam manicure, without the bother of creating it for yourself! I don't wear falsies too often, but these will look great for a red devil or cat at Halloween. They are so shiny! Nailene nails are available from Boots and Superdrug. Cute post, i love that nail polish!